So what is the best camera? That's a really broad question because people are looking for so many different types, from simple point-and-shoot compacts to more advanced DSLR and mirrorless models. So our guide covers the whole spectrum, from the best all-round cameras for most users, through cameras for beginners, for enthusiast and cameras for everyday casual snappers. Update: It's true that traditional point-and-shoot cameras are in decline, but they're still really popular for casual vacation photography and family use, combining great value for money with easy to use controls. There's also a lot of debate about DSLR vs mirrorless cameras right now, but the fact is that there are pros and cons to both, and that DSLRs are still very much alive and kicking – and definitely in our list of the best cameras you can buy right now. And the best bit? There are lots of cheap camera deals right now – you'll see today's best prices below (and we've got a separate guide if you're looking for the best dash cam to use in your car). If you’re a pro or an expert you’ll probably be looking at a full-frame mirrorless or full-frame DSLR camera, while enthusiasts and beginners looking for an interchangeable lens camera but something cheaper and lighter will be better off with a smaller-format APS-C or Micro Four Thirds model. If you don’t need interchangeable lenses, though, a compact camera with a fixed lens is a great choice, and this is where you’ll find the largest variety of camera types and prices, from advanced compact cameras for experts through long-zoom bridge cameras and superzoom travel cameras though to simple low-cost point-and-shoot cameras that the whole family can use. We start off with our top recommendations for all-round cameras for all kinds of photography, picking cameras to suit every price level. Maybe you don't need a mirrorless camera or a DSLR and you're looking for something simpler? We list our favourite compact cameras for travel, adventure or even simple family use. If you want to record your life in video, why not check out the best action camera? Or maybe you've got your sights set a bit higher and you want to upgrade to a full-frame or professional camera? We've got that covered too. So keep reading to find the best cameras you can buy right now, regardless of your experience, expertise or budget! Whether you want to shoot sports, 4K video or all-round photographic subjects, the X-T3 does it all brilliantly. It has Fujifilm's latest 26.1-megapixel APS-C format sensor with 11fps continuous shooting that goes up to an amazing 30fps in 1.25x crop mode with its electronic shutter. Fujifilm’s new autofocus system covers pretty much the whole image area and it can capture 4K video at 60/50fps, a feat that only dedicated video-centric cameras like the Panasonic GH5S have been able to manage until now. The only thing missing is in-body stabilization, but in the context of everything this camera can do, that's a minor issue. DSLR cameras like the Nikon D3500 continue to be popular because it's hard to get a mirrorless camera with a viewfinder at anything like the same price. But the Sony A6000 is the exception! Despite the arrival of the A6300 and A6500, the Sony A6000 remains in Sony’s Alpha lineup – and that’s a smart move on Sony’s part. While the latter two models can satisfy enthusiasts and those keen on shooting 4K video, the A6000 serves as a more affordable introduction to the system – one that still absolutely holds its own against even pricier cameras. Thanks in part to a 179-point phase-detect AF system spread broadly across the frame, it's particularly adept at tracking moving subjects, with its 11fps burst shooting option helping you to get the decisive moment. This is a great mirrorless camera at this price, especially if you really don't want the bulk of a DSLR. So far we've been looking at interchangeable lens DSLR and mirrorless cameras, but that's not the only option. Sometimes a fixed lens compact camera will be fine, especially if you want to do a lot of travelling, and if you're more concerned wiith capturing the moment than fussing over technicalities. A superzoom travel camera is the perfect solution, but most have really small 1/2.3-inch sensors which limit their picture quality. The Panasonic TZ200/ZS200 is different. It has a much larger 1-inch sensor for much better pictures, matched up with a big 15x zoom – and yet it will still fit in a jacket pocket when it’s powered down. So the TZ200/ZS200 isn’t exactly cheap, but it’s surely one of the best long-zoom travel cameras you can get, and it has features and controls that will even please experts. The TZ200/ZS200 is great, but sometimes it's not a big zoom range you need but a camera that can stand up to tough treatment. It’s not about big sensors, huge zoom ranges and fancy photographic controls! The Olympus TG-5 is shockproof, waterproof and freeze-proof. It has a 4x zoom lens and can be operated by anyone that can press a shutter button. If you’re swimming, climbing, kayaking, ski-ing or (worst of all) giving a camera to a small child to take a picture with, the TG-5 is made to take it. You don’t get DSLR quality, but you do get a camera that will keep on working when others would simply disintegrate. Our third compact camera choice is different again. This time we've gone for a camera that's cheap, effective and practical enough for the whole family to use without worrying about it. With its small sensor and simple controls, the Ixus 185 is about as far away from a DSLR as a bicycle is from a Harley Davidson, but that’s not the market it’s designed for. If you think of it instead as an alternative to a smartphone, it has A LOT going for it. For a start, there are no smartphones with an 8x optical zoom, and the price of the Ixus 185 means you don’t have to lie awake at night wondering if you’ve got it adequately insured. It’s perfect for kids, teenagers and technophobic adults who want a camera to take pictures with and to keep their phone for making phone calls. If you're a keen photographer upgrading an existing camera, quality and feautres are going to be high on your shopping list, and the Canon EOS 6D Mark II offers both, but at a surprisingly reasonable price. Canon’s 2018 was dominated by the speculation and then excitement around the launch of its EOS R full frame mirrorless system, but many users still prefer the size and handling of a DSLR, and the Canon EOS 6D Mark II is Canon’s cheapest full frame DSLR and a bit of a slow burner, as steady price drops have made it more and more appealing. Its 26-megapixel resolution and 6.5fps continuous shooting speed are unremarkable, but its effective control layout, vari-angle touchscreen and rather good live view autofocus give it really nice handling. If you want to step up to full frame DSLR photography, this is a very effective and affordable way to do it. Despite the relentless march of mirrorless cameras, DSLRs are still very popular amongst professional users, and the Nikon D850 is a stand-out example. This is largely down to its chunky, rugged design and its versatility. The 45.7MP sensor provides bags of resolution for landscapes, fashion and still-life setups, while 7fps burst shooting and a 153-point AF system means it’s equally at home when faced with action – and you can boost this to 9fps with an optional battery pack if you need to. Wedding photographers will love the silent burst shooting mode, and it captures 4K video too. On top of all that, the robust, weather-sealed body means you can easily rely on it in even challenging conditions. The Nikon D850 is easily one of the best professional-level cameras you can buy. With all the big mirrorless announcements from Nikon, Canon and Panasonic in 2018, it feels like Sony has been left behind. But Sony was the first to enter the full frame mirrorless market and still has one of the best line-ups – not to mention the best premium quality lens range. The Sony A7R III is like the Nikon D850, but in mirrorless form. 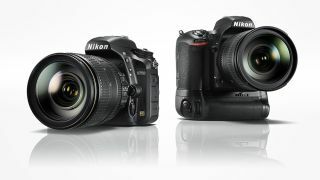 Like the Nikon, it combines sky-high resolution with a super-fast 10fps continuous shooting speed and 4K video. Physically, however, they are very different cameras. The most obvious difference is the much smaller body of the A7R III, though any size advantage is quickly offset by the size of Sony’s lenses, which just as large as full frame Nikon lenses and, in the case of Sony’s G Master series, often larger. What recent rivals have done, though, is push down Sony's prices, so the A7R III is not just a great camera, it's also become a great bargain.